The Domes are considered by many to be the gem of Milwaukee’s nationally recognized PARKS system. The current structures were preceded by a glass-encased conservatory built by the City Park Commission in 1898 on land purchased from the MITCHELL family. It was replaced sixty-one years later with a new facility designed by local architect Donald L. Grieb. The new design included three domes: the desert (or arid), the tropical, and the “show” dome featuring seasonal plants and special exhibitions. First Lady “Lady Bird” Johnson dedicated the seasonal dome in September of 1965, while the tropical dome opened in 1966 and the arid in 1967. The construction of the Domes coincided with a larger city revitalization scheme that included the creation of the MILWAUKEE COUNTY ZOO and the relocation of the MILWAUKEE PUBLIC MUSEUM. 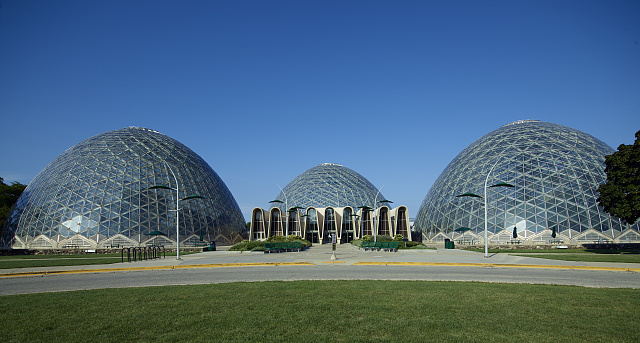 ^ John Gurda, “Summer under Glass: Mitchell Park’s Conservatory Preceded Mitchell Park Domes,” in Cream City Chronicles: Stories of Milwaukee’s Past, ed. John Gurda (Madison: Wisconsin State Historical Society Press, 2007), 155. ^ “History of the Domes,” goMilwaukee, county.milwaukee.gov/ConstructionoftheDom10361.htm, accessed October 13, 2011. ^ “Friends of the Domes: Mitchell Park Horticultural Conservatory,” accessed October 13, 2011. ^ “Domes Dedicated by Mrs. Johnson,” The Milwaukee Journal, September 21, 1965, 5; “Parks, Recreational, and Culture Functions,” The Milwaukee Journal, October 28, 1967. ^ John Gurda, The Making of Milwaukee (Milwaukee: Milwaukee County Historical Society, 1999), 270-271. Anderson, Harry. “Recreation, Entertainment, and Open Space: Park Traditions in Milwaukee County.” In Trading Post to Metropolis: Milwaukee County’s First 150 Years, edited by Ralph M. Aderman, 255-323. Milwaukee, Milwaukee County Historical Society, 1987. Gurda, John. “Summer under Glass: Mitchell Park’s Conservatory Preceded Mitchell Park Domes.” In Cream City Chronicles: Stories of Milwaukee’s Past, 153-155. Madison: Wisconsin State Historical Society Press, 2007.